The Maverick M-570 Batch & Exception Check Encoders, lists, updates totals, and optionally endorses all types of financial documents in a single pass. Streamline your daily operations even further when you select one of Maverick's industry standard Exception, Batch, P.O.D.,or Cash Settlement applications. Our Exception Item application provides single or full-field encoding for all types of exception items. 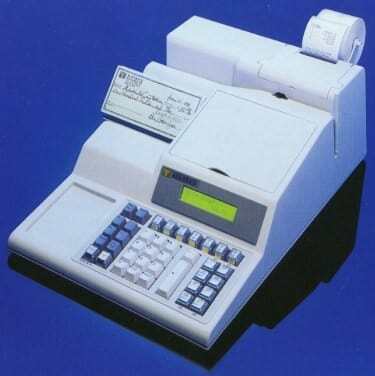 It is a valuable tool behind the teller row for lobby deposits, counter checks, and starter kits. Encoding at point-of-entry allows proof and item processing departments to operate more efficiently by decreasing the time it takes to handle exceptions in these production oriented environments. Batch, P.O.D., and Cash Settlement applications allow retail customers to pre-encode the amount field as part of their daily deposit processing. Tendered media (Cash, Checks, Debit Cards, Credit Cards, Gift Certificates, Coupons, etc.) is processed in one simple and cost efficient procedure that does not increase your end of the day processing time or cost. The MICR V is a modular system that allows you to increase efficiency by adding a high capacity endorser, an autofeeder or sort pocket capabilities. Combine the MICR V with an Autofeed module to increase throughput and expand the processing window for deposit preparation and reconciliation.